It was a day like any other in January - beautiful, quiet, and cold. We went out to check on the beach and take some photos of the orange skies above. But believe it or not, I don't have a single decent shot and I blame my hair for that. It was flying all over, sticking to my face, to the camera lens and on to my gloves. I had forgotten what static hair was but I guess it was time for me to remember. Since I guess many of you are often in the same situation during the cold months I decided to share some tips on how to deal with static electricity in your hair. The air indoors is drier than normal due to increased heating. The air utdoors is colder than normal. Hot showers you are tempted to take dry your hair and skin. The chemicals in shampoos and conditioners (designed to moisturize your hair in a vicious, toxic way). Your hair gets even drier by blow-drying. Now addextract the fresh fruits and vegetables that you eat from spring to autumn, leading to decreased intake of vitamins and minerals. And there you have it - lifeless dry hair sticking out and making you look like an urchin. The most important thing you have to do to prevent static in your hair is to keep it moist. And that you can do without store bought shampoos, conditioners or anti-statics. Use a hat in the cold weather so that you don't subject your hair to low temperatures. Try to humidify the air inside. I will not offer you to buy a humidifier though. A very cheap trick that I've been using for years is to place a thin neck bottle on the radiator and let the water evaporate thus humidifying the air. It works perfect! Take showers with lukewarm water in stead of hot. You will save your skin from drying out as well. Don't use shampoo. Go for baking soda, or any other natural ingredient shampoo that might be sold in your local health shop, or choose from etsy, but don't use regular shampoo. The chemicals in it will not only dry your hair out but will do much more damage than you imagine. The same goes for store-bought conditioner. Don't use it! Mother Nature has already created everything we need to be beautiful and healthy, just use what she has to offer. The internet is abundant in natural homemade recipes for moisturizing conditioners. Try to avoid blow-drying your hair. This is seriously killing it. Let your hair air dry instead. And last but not least, make sure you are eating healthy. Not just for the sake of your hair but for your whole body and mind. Drink a pill or two of fish oil a day. The Omega-3 is your best friend forever. Thanks for your advice, Gracie! We will surely try this out! How has your hair been doing this winter? Do you have a special treatment for it? I made some homemade lotion with beeswax and coconut oil. I slather it on my hands and feet this time of year. It also works beautifully as lipbalm, and I put a little on my jeans and run them through my hair to tame static. I put a little on my hands and run them through my hair. Not my jeans! Sarah, your lotion sounds just what one may need! Thank you for sharing your tip. Do you have the recipe published anywhere, so that i can link to it? We're not the only ones suffering from static electricity in our house...our cats are too! When we pet them we both get shocks!We definitely need more humidity in the house! Poor cats! There must be weird noises too :) Have you tried humidifying with the simple method I mentioned? I have to admit, it was hard to focus on this article with that photo up there! I have a smile from ear to ear and could not take my eyes of the image. Now that I have finally got to read the article - thank you - I have very thin hair so static can be a huge issue especially during the dry winters. I will give these tips a try! He he, Brandy, I've had the same happen with me on your blog recently! Do you really wash your hair every night? Why? Wow, I have to try this out! With winter weather really kicking in this past month, my hair has been half-stuck to my face (though nothing as dramatic as the little guy in the picture :P), so this post is perfect. Interestingly enough, though I generally try to be good about most of these rules - except for hot showers, how can you say no when it's so cold out?!? :P - my hair is still quite "static-y". I'm going to have to try the dryer sheet trick I saw in the comments and see if it works. Ana, you are welcome to the Kanelstrand blog and yes, it is so hard to refrain from hot showers in the winter! I hope you will come back and tell us how the dryer sheet worked out for you! 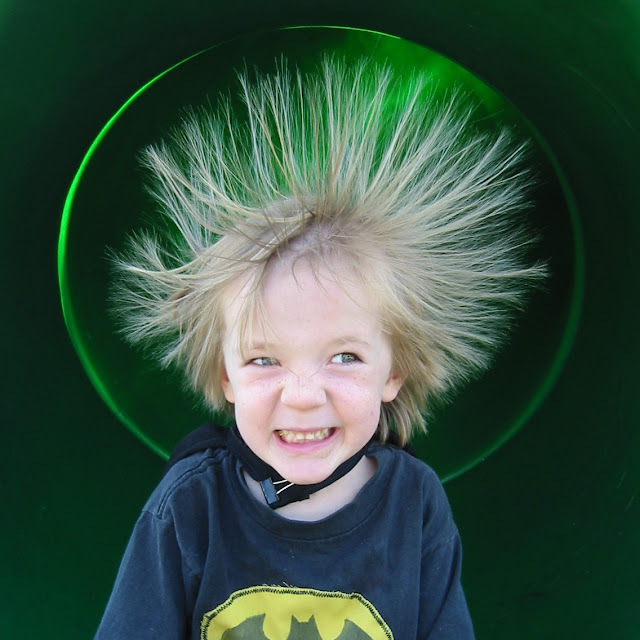 Actually, my doctor said that static is a sign of HEALTHY hair. The DRY air causes the static in healthy hair. That gives me food for thought! So u just make a paste with the baking soda and apple cider vinegar? How much would u use for thick, medium hair? No! Don't mix the baking soda and the vinegar! You have to dilute 1 tablespoon of soda in 1 cup of water and wash your hair with it. Then use 1 tablespoon of apple cider vinegar diluted in 1 cup of water as a conditioner. Just one thing I want to mention. Though using a drier sheet may work, I would personally not suggest it. There are MANY, MANY chemicals in drier sheets and I don't even use them in my drier. In fact, if you put drier sheets in your pockets or on the outside of a shed you will have NO rodents, bugs, etc. If they don't want to go near drier sheets, I'm not sure why we would want to have them anywhere near our skin. Just my thoughts on the subject. Tiny bit of cocont oil.